Always be ready! | Working. Together. Monday’s seem to be the day that most of us least look forward to. The weekend is over, and it is back to work. When we hold that attitude, what possibilities might we be closing ourselves out of? With the importance of being ready for opportunities in mind, here is a guest post by my friend Joel Dillard (with a few thoughts from me at the end). [Joel] So kinda a cool story (for me at least). I was in Seattle a couple weeks ago for business and because of the 3 hour time difference to MI, I was waking up each morning at like 4:30 AM Seattle time. One of the mornings I decided that I wanted to go find, and get a coffee from the original Starbucks since I knew it was located somewhere in the city. Our hotel was right downtown, so I knew it wouldn’t be too far away. I googled the address and then set my navigation to take me there, and also grabbed my camera so that I could take some pictures of the city and the Ocean. 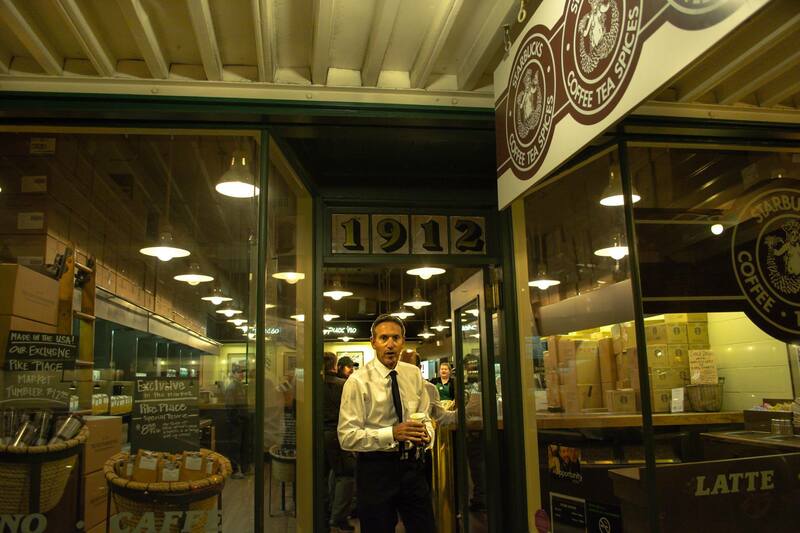 I eventually found the original Starbucks (1912 Pike Place Market) at about 6 AM and decided to take some photos of the store front to mark the occasion. As I was snapping a picture of the address above the door as proof of where I was, a man happened to be walking out at that exact moment (he’s in the picture below). Right after I snapped the photo, I walked into the store to buy my coffee, but before I did, the man in the picture stopped to hold the door for me and was very pleasant as he said “good morning”, and told me to “have a great day”. I probably would not have given this man a second thought had he not been such a nice person. As I walk into the store, I turn around to see what the man would do and notice that he gets into a very expensive Porsche parked in front of the store. At that moment, a light goes on in my tiny brain and I start thinking that the man’s face was very familiar and that I should know who he is. Then all of a sudden it dawns on me – It was Howard Schultz the CEO of Starbucks. I knew this because while in college, I had to do a semester long research project researching organizational behavior issues related to Starbucks and spent about 10 weeks learning everything there was to know about Howard Schultz and his company. I also asked the girl behind the counter in the store if that was him and she said “yes, there was going to be a shareholder meeting that day, and he always goes to the original Starbucks on shareholder meeting days and performs some sort of good luck ritual”. [Todd] So beyond being one of the most amazing bump-in-to-you stories I have ever heard, this account also illustrates the value of being ready. The story on its own is quite impressive – an out of town worker choosing to get up and experience the sights of a new place rather than just taking it easy in the hotel, someone recognizing the value of seeing famous landmarks and acknowledging the impact of major organizations, and taking pictures to commemorate life experiences – but the uniqueness of the image (which should be the new public relations glossy for Mr. Schultz) paints such a vivid picture of the interaction. Sometimes as the saying goes “showing up is 80 percent of life” (Woody Allen). Joel showed up and now has an amazing story and photo to prove it. What do you need to show up for? Are you ready? How are you going to be ready?